Author: Robert Perry (Reliance Rolls), Auckland, New Zealand. I agree that Joplin most probably did play the marking piano at Connorized. He was in the right place in the right time, and Connorized certainly made much of the fact. In fact, I've seen an Edwin F. Kendall-played Connorized roll that was produced roughly the same time as the Joplin rolls. I had no idea Mike Montgomery had put up the idea already, and if there's some evidence that Kendall was friends with Joplin, is a great theory that fills in all the blanks. If you examine the Connorized Joplin rolls, you'll note that they are mathematically perfect - ie, every crotchet, quaver, etc. is lined up with the other notes in the chord, the note duration is exactly the same. They are the equivalent of a 'sequenced MIDI'. Compare with the Aeolian Uni-Record rolls, which are completely mathematically imprecise - you can see this simply by loading any Uni-Record roll MIDI into Cakewalk or a similar programme. This is not a reflection on the pianist's ability. No pianist is capable of playing exactly mathematically correctly - not even a Rachmaninov, a Hoffman, or a Gould. Mike Montgomery has been studying piano rolls longer than I've been alive, and I don't doubt he's fully aware of this already! We know Aeolian used a recording piano in their New York studios that perforated a master roll directly as the pianist played, with the first master being accurate to 1/60th of a second for each key depression. We know little about Connorized's production methods except that they probably used a marking or stencilling recording piano as most roll companies did. This created a master roll marked with carbon, which then had to be perforated by hand, with all the opportunities for mistakes, corrections, etc that this entailed. 3. Marketing and Production Style. Every newspaper in the world has a 'style guide' - containing a list of 'banned words', fonts to use in different circumstances, the newspaper's 'official' spelling of a word with more than one spelling option, etc. Roll companies were no different, and all had their own 'musical style guide', which may have varied from arranger to arranger, but the machinery and equipment available dictated a large part remain consistent. When we compare fifty or so Connorized rolls with the equivalent number of Aeolian Uni-Record rolls, we see an ENTIRELY DIFFERENT marketing philosophy. The Connorized rolls are strictly mathematically quantitized, they normally utilized 'house artists' who weren't "famous" per se, they are often embellished far and beyond what a single human with ten fingers could play. Aeolian, on the other hand, was many times the size of Connorized, and had different brands for different styles of roll. There were the normal, mathematically arranged rolls, which you added your interpretation to. There were Metro-Art (hand played rolls that seem to have been embellished in places), MelODee (hand played rolls that were quantitized and edited), and the list goes on! The Uni-Record rolls were marketed as being "faithful records of the hand performances of eminent pianists. More than this, they represent the best efforts of each individual pianist. From a large number of records which the pianist makes of each composition, the one is selected in which both technique and mood are at their highest pitch of inspiration." From my studies of Uni-Record rolls, they appear to have had very little editing done - I've never seen one that wasn't achievable with ten fingers, and they all contain rubato, shortened and increased note lengths, and other very human traits. 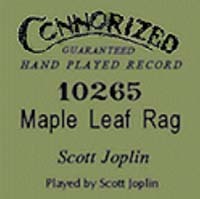 By contrast, many of the Connorized 'Guaranteed Hand Played Records' (the sub-brand the Joplin rolls were released on) are striking fifteen notes at a time, there is no rubato, no note that's not mathematically perfect. 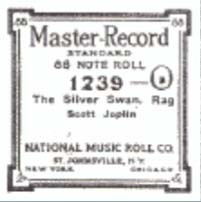 The Joplin Uni-Record roll contains a few minor deviations from the printed score but the bass octave embellishments which are so noticeable in the Connorized Joplin rolls are completely absent. When you compare Connorized rolls credited to Connorized staff artist William 'Billy' Axtmann (aka 'William Arlington'), the bass runs are present in rolls made years before Joplin showed up. For anyone to claim that Joplin just happened, by coincidence, to use the exact same bass runs in April 1916 as a company arranger was using, then drop them completely two months later for a recording for a different company. is stretching the bounds of credulity. So if you agree with me and discount the bass runs as being added post-production by Axtmann during the editing process, what do we have left? The performance has already been corrected to be mathematically accurate, so you have pretty much nothing of Joplin left, with the possible exception of the Magnetic Rag slower intro, and the arpeggios present in Pleasant Moments. By comparison, you have a Uni-Record roll that was punched directly as the pianist played, bearing all the hallmarks of a human performance with apparently little editing done to 'fix it up'. In the case of Joplin, who apparently never made any acoustic recordings, this is going to be infinitely more valuable than a completely mathematical, quantitized reproduction of the Maple Leaf rag score with a few later embellishments that appear to bear all the hallmarks of someone else! 5. Step Rate of Production Rolls. Connorized rolls of the Joplin era used an EXTREMELY coarse step rate for the perforators. This dictated how many possible 'punch' locations there were per inch of paper. The Connorized Joplin rolls use a step rate of 132 rows per foot. That's only 11 possible locations for the note to start or finish per inch of paper. Sounds like a lot, but in practise, for genuine handplayed recordings, is fairly useless. Rubato, broken chords, arpeggios, minute timing variations will all sound jerky and imprecise unless mathematically perfect. Compare that with the Aeolian Uni-Record rolls, which use a step rate of 408 rows per foot. That's the highest step-rate I've seen of ANY roll of that era, higher even than the Ampico and Duo-Art rolls which were reproducing classical performances by the most famous pianists in the world. Our Uni-Record editor now has the choice of 34 different note on/off positions per inch! He can pack three times more accurate information from the recording master into an inch than the Connorized men can. Thus, it is unlikely that the Connorized production rolls contain any useful information about Joplin's playing style, with the POSSIBLE exception of the slower Magnetic Rag introduction, the arpeggios in Pleasant Moments that don't appear in the sheet music. I do believe that the single Aeolian Uni-Record roll credited to him is an extremely close reproduction of his playing, virtually unedited.